I shaped 2 bears from white bread and stuffed them with chicken floss inside for today's snack bento. The box was just filled with some fruits (strawberry, golden kiwi, orange) that we had to finish today. We are still in dry season ... it's a hot day today. I drove the kids to school this morning and the sun was so bright making the driving uncomfortable. How about you? Are you enjoying the weather wherever you live right now? Little A is a bit fuzzy when it comes to fruit. He will only eat some of his favorite fruits. I'm trying to buy different fruits every 2 or 3 days just to get him to try other fruits too. As my 2nd Blog Anniversary will be on July, 23 and I don't usually blog on Saturday, so tomorrow I will post the giveaways. All you need to do is just put your comment, any comment is fine then I will draw 2 winners for the giveaways. Until then, stay safe and have a great day all! Cheeky bears..:) is that a white lace baran? or a napkin? looks pretty..
wow! how did you mould bread into bears? U never fail to impress me! Please teach me, cikgu! :D And happy be-early anniversary! You're so creative! 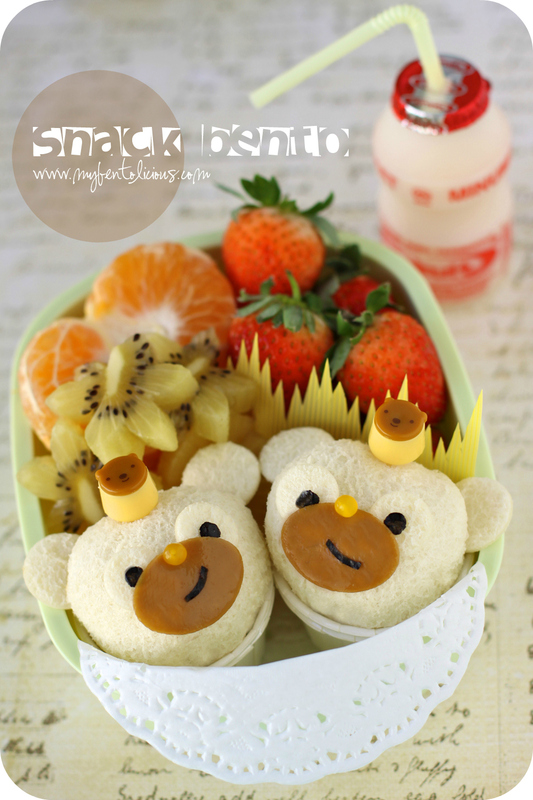 And this bento Bear really Kawaii^^ I love seeing your photos, and learning your method in making bento! I´ll be back for the birthday party! Congrats on your 200th post and your 2nd year anniversary Lia! They’re so neat & adorable too. Congrats on the 200th bento post! Sure will dropby ur blog again 2molo for the giveaway..
@Amaaris : Thanks a lot! @shaz : Thanks a lot Shaz! @Fang Fang : Thanks a lot! @MeRy : Thanks a lot Mery! So tender and sweet, pretty and subtle colors here, too! Thanks as always for the beautiful inspiring bentos you create, Lia! Cute bears indeed! I am a newbie to Bento and found your blog very interesting and have been coming back often for ideas and tips. Thank you for sharing. Stuffed the bread by wrapping with plastic wrap? So soft and fluffy, like a real bear. Love it! Our weather is finally getting getting warmer, like in the 80s, and I'm so happy about it! Really look forward to feeling hot for a change. dear Lia Chen, I love all your bentos! I ve just started my bentoing journey months ago, it was absolutely great experience!Today i ve packed 26simple bentos for kindy, for my daughter s 5th birthday~ its my very 1st time packing so many bentos for children~ cant wait to share with you here this great experience! It will be another year already for your blog? time really flies away. Congrats, Lia... your blog always be my inspiration. Congratulation! Wow 2 years! Keep the ideas coming, u inspire lots! Plus I love that drink at the end! Lia chen, how do u shape the bear ball?what is the ingredience?